Preheat air fryer to 350°. Place garlic, olive oil, salt and pepper into a small pan/pot and warm on medium heat until aromatic and mixed. Remove the pan from heat and add the brussels sprouts, tossing to lightly coat in oil. 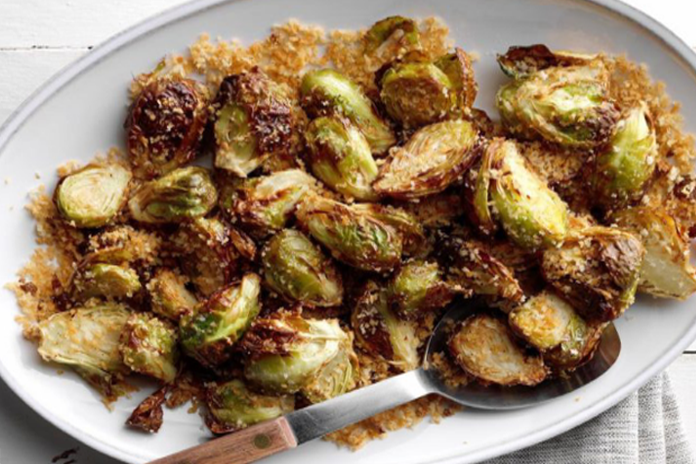 Transfer the brussels sprouts into an air fryer basket and cook for 15-20 minutes, stirring every 4 minutes. Remove sprouts when nearing desired tenderness and are lightly browned. Add bread crumbs to the oil mixture and then sprinkle over the sprouts. Continue cooking the sprouts until browned and tender, approximately a further 3-5 minutes. Serve hot.